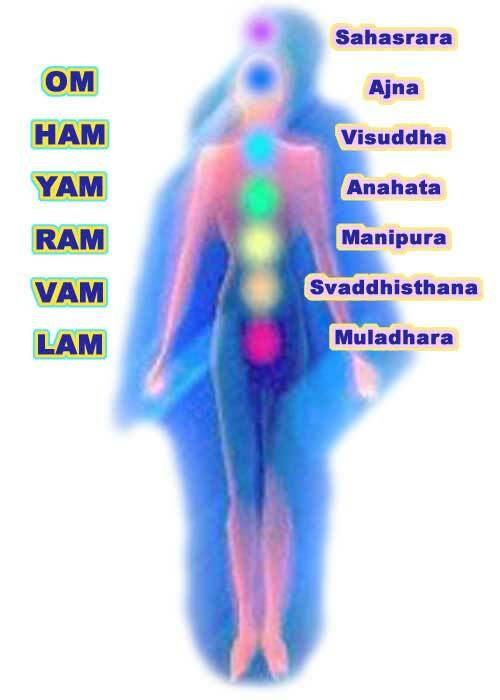 We recommend Ajarn (Teacher) Singhathon's Chakra meditation. These chanted sounds and visualizations activate your body's natural energy centers and revitalize your non-physical bodies. The contents of this webpage are taken from the book How to Increase Life Force and to Fight Cancer, by Ven. Singhathon Marasoanho (M.A. Ph.D.). Ajarn was raised as a monk from childhood, he went to India and was the first Thailand monk to received a doctorate in Bhuddist studies from India. He returned to Thailand, disrobed and taught at Chiang Mai University as a layman for over 20 years. Then he was diagnosed with cancer. He knew the only way to cure his illness was again to take vows and become a monk. He's now over 70, healthy, happy and teaching us crazy farangs. He's one of those few people that practices what he preaches (every minute of every day). We love him! If you come for a visit maybe you to can have an aura cleaning from Ajarn Singhathon. That would be auspicious! To perform this meditation you will chant sounds and visualize moving colors under your palm while placing a hand over each chakra location. Start with one hand over your third eye - a finger width above you eye brows. Mentally imagine a spiraling Indigo cloud penetrating from the in front of your forehead, going through your brain and exiting out the back of your head. Take in a deep breath and exhale while chanting Om. Continue with your opposite hand, place it over your throat, mentally imagine a spiraling sky bluecloud penetrating the front of your body, going through it and exiting in the back. Take in a deep breath and exhale while chanting Ham. Continue with your opposite hand, place it over your heart, mentally imagine a spiraling green cloud penetrating the front of your body, going through it and exiting in the back. Take in a deep breath and exhale while chanting Yam. Continue with your opposite hand, place it over your solar plexus/sternum, mentally imagine a spiraling yellow cloud penetrating the front of your body, going through it and exiting in the back. Take in a deep breath and exhale while chanting Ram. Continue with your opposite hand, place it a bit below your navel, mentally imagine a spiraling orange cloud penetrating the front of your body, going through it and exiting in the back. Take in a deep breath and exhale while chanting Vam. Continue with your opposite hand, place it over your private parts, mentally imagine a spiraling red cloud penetrating the front of your body, going through it and exiting in the back. Take in a deep breath and exhale while chanting Lam. Continue up your spine, doing your best to get a hand over each area. Start with one time down your front and one time up your spine. Work you way up to 3x in front and 3x in back. The first few times you start chanting mantra's you may get a head-rush so take it slow. Eventually, you'll start to get sensations in your body and palms. When you do, drop us a note and we'll share your experience with others.